Born in Germany to a musical family, Joshua began learning the flute at the age of five, becoming a fine flautist while still a child. Born in Germany to a musical family, Joshua began learning the flute at the age of five, becoming a fine flautist while still a child. As a teenager he was soon performing in various Rock, Jazz and Fusion bands as a flute and saxophone player, always searching for new ways of expressing and expanding his music. However, a musical “discontent”, combined with his search for the spiritual, pulled him, perhaps inevitably, towards India – her culture and her music. 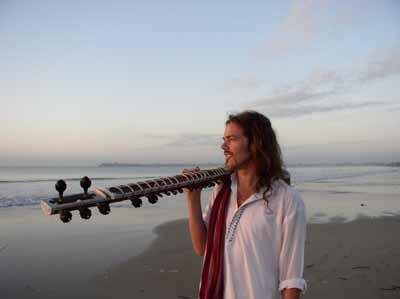 This experience changed his way of perceiving music completely. Thus it was, that in the late seventies, at the age of 18, he left school, home, ended all his career plans, and traveled instead overland from Europe to India – following the irresistible pull that the East had now cast over him. On his subsequent overland trips eastward he traveled extensively throughout countries such as Greece, Turkey, Iran, Afghanistan and Pakistan. And in each place he became deeply involved with the indigenous folk music he found there, playing live with and learning from, local musicians everywhere. “I loved the roots of this music and felt an immediate connection; something that I had missed so much in Central European music,” he recalls. When he finally reached India he had a sensation of knowing it; it felt like coming home! Along with the feeling of familiarity there seemed to be an inexplicable vibe of “at-ease-ness” in this country of mysteries, contradictions, colors and smells. And this coming home to India was only the beginning of a much more all-encompassing journey… for on his travels he came across the enlightened mystic, Osho. In the presence of this man with a long white beard, eyes as deep as the ocean and a crazy sense of humor, Joshua came in touch with an altogether different kind of music; the art of the “inner music”… silence. 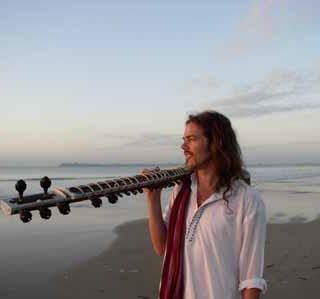 While diving deep into this new world of ‘silence’ Joshua also found the time to learn Indian music from one of India’s finest teachers, sitar maestro Ustad Usman Khan. Years later after many years of study in India, in the early nineties when Osho had left his body, Joshua returned to the West. He and his music had totally changed – it was time to share the overflow within… and time for his music to really blossom. To date he has released 14 albums under his name and played on countless studio recordings. He has traveled the world numerous times and plays to an ever increasing number of music lovers, inspiring them with a musical message that reaches beyond the borders of tradition, politics, religion and belief.